USPS – Yes or No? » Embroidery Talk Has Moved! USPS – Yes or No? 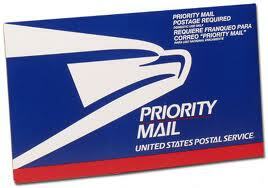 Lately we’ve been pondering the idea of adding United States Mail as a shipping option. This has been mentioned several times in the past, and we were always wary of doing it, largely because of concerns about tracking packages. We all know that packages can go astray and, when that happens with a package delivery service like FedEx, we have a resource. We can track the package and at least have some method for determining what happened and why. Sending packages via regular U.S. Mail didn’t offer that same level of support and security. Upon further research, however, we discovered that the U.S. Mail has some shipping options that would allow us to track packages. Priority Mail is the option we are contemplating at present. Before, however, we start stocking supplies, and go through the necessary steps to set up the required shipping module for our online store, I had a question. If we did decide to offer Priority Mail or some other U.S. Mail service, how many of our customers would use that service? I expect that, for some customers, adding additional shipping options would make no difference. For others, particularly those who are far away, like customers in Alaska and Hawaii, Priority Mail might be a welcome addition to EnMart’s shipping options. We would love to know your thoughts on this subject. If you have an opinion, whether you’re for or against us adding a U.S. Mail shipping option, please share it in the comments, send me a Tweet, or leave a comment on EnMart’s Facebook page. This entry was posted on Tuesday, October 26th, 2010 at 11:27 am and is filed under About EnMart. You can follow any responses to this entry through the RSS 2.0 feed. Both comments and pings are currently closed. As one based in Hawaii I must give you a very strong YES to whether you should offer shipping by USPS Priority Mail. I use it for sales from my website and have found it reliable, far less expensive, and usually quicker than UPS or FedEx for shipping to the mainland. Mainland retailers often do not appreciate how many potential customers in Hawaii and Alaska are desperate for reasonably priced shipping. Not only is the postage on flat rate boxes quite reasonable, the shipper can save on the cost of shipping materials since the post office gives the boxes to customers at no charge. You are here : Home » USPS – Yes or No?